The credit card behemoths are one way to invest in the payment industry, but new players that are breaking the mold are offering investors a chance at far better returns. Investors could do far worse than the payments industry over the last year. 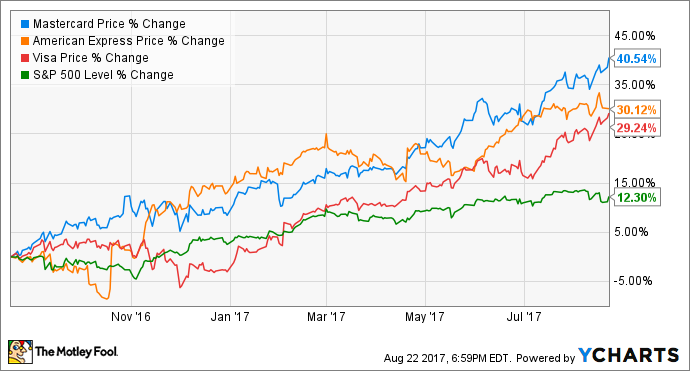 Some of the biggest names in credit cards are represented, and the three largest, Visa, Mastercard, and American Express, have at least doubled the performance of the broader market over the last 12 months. There's nothing wrong with going with the biggest players. The thing is, failing to look outside the big three could be a costly error for investors looking to rack up significant gains. Innovation is the name of the game, and companies determined to bring payments into the modern age have much to offer. 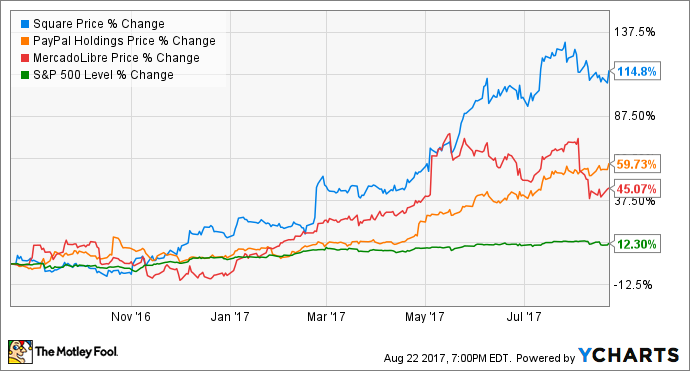 Here's a look at three such innovators: PayPal Holdings, Inc. (NASDAQ:PYPL), Square, Inc. (NYSE:SQ), and MercadoLibre, Inc. (NASDAQ:MELI). Investors should cash in on these new payment systems. Image source: Getty Images. PayPal began its existence as an online payment service, but has increased its reach over the years. For one thing, the company has sought to expand its offerings by partnering with all the major credit card companies, as well as the banks that issue them. And subsidiary Venmo, a social payment platform, is a hit with millennials, growing 103% year over year in the most recent quarter. In addition to sending money peer-to-peer, users will soon be able to pay merchants using the payment method. To boost the convenience of its payment system, the company has added the One Touch feature, allowing a customer to stay securely logged into PayPal on a phone, tablet, or PC, without having to retype his or her password, billing, or shipping information for each purchase. In its most recent quarter, PayPal saw revenue growth of 18% year over year, while earnings per share grew 27%. Customer accounts increased 80% over the prior-year period, to 210 million active users, resulting in 1.8 billion payment transactions. The company credits its move from a product to a platform company and its work to become a "more central way for consumers to manage and move their money." Beginning with the introduction of a simple smartphone-mounted mobile card reader, Square has become the company that makes it easy for businesses to accept payments anytime, anywhere. While its payments segment still accounts for the bulk of revenue, the company has expanded into a variety of small-business services including employee management and payroll, customer relationship management tools, and working-capital loans. Providing these payment and small-business solutions has been lucrative: In its most recent quarter, Square grew its revenue 26% year over year to $552 million, and gross payment volumes topped $16.4 billion, up 32% over the prior-year quarter. While the company is "squarely" in growth mode, it has yet to become profitable -- though its loss of $16 million was a big improvement from the $27 million loss in the prior-year quarter. For many U.S. investors, it may be difficult to conceive of a place where most transactions are still done in cash and a majority of the people don't have a credit card or even a bank account. You'd be forgiven if you hadn't heard of MercadoLibre, but it is home to one of the most used and recognized payment methods in Latin America. As the largest provider of e-commerce in the region, the company developed MercadoPago, its online payment service, to facilitate transactions in much the same way as PayPal. MercadoPago has become ubiquitous, not only on the company's e-commerce platform, but as the leading online-payment solution in Latin America, allowing users to send, receive, and finance payments, which can even be sent via email and social media. Payment transactions saw their 10th consecutive quarter of year-over-year growth in excess of 60%, as off-platform merchants adopted the payment service. Payment volume topped $3.15 billion for the most recent quarter, representing year-over-year growth of over 73%.